Squid Ink Pasta | Izzy have you eaten? As our time together in the Northern Hemisphere draws to a close, I am anxiously reviewing in my mind what of your favourites I still haven’t cooked. It has been a strange December, with dad traveling so much, and you taking care of me so patiently while I’ve been in this air cast boot from my fall. Endless cups of tea, a cheery smile and such encouragement from my two girls. Lucky me. But not much cooking, as I’ve just been so much slower getting around. I did whip up very quickly a favourite on Thursday night. It was between Claudia’s Nativity concert and her art class end of year Christmas drinks. We were all so tired and hungry after long days, and only had about 50 minutes at home before dashing out again. Of course I had the dried squid ink pasta in the pantry, so the rest was easy. We all love this dish. Funny really, seeing that Claudia has a deep aversion to any seafood that is not a straightforward FISH. But squid ink pasta? You both have adored it from the very beginning, even as small children. You eat it topped with left over bolognese sauce, or with pesto tossed through it. I love it tossed with good oil, and sprinkled with sautéed garlic and chill flakes. Simple and SO good! In all the cities we’ve lived, our measure of a good Italian deli has been if it stocks a decent variety of dried squid ink pasta. In Virginia, it took me a while to scout it out, but within a year of living there, I could even buy it fresh by the pound, just on Main street. That was a thrill! While many recipes for squid ink pasta include seafood, ours is with salad ingredients and crispy bacon. The briny taste of the pasta is a nice balance with the bacon. I always think this dish could do with some lovely fresh prawns thrown in, but you and I know your sister would have a fit. Try it! 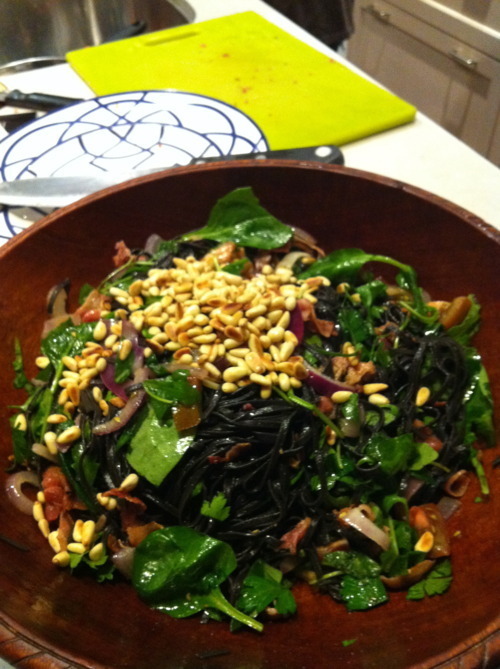 This entry was posted in GROUP C, Uncategorized and tagged Bacon, Pasta, Pine Nuts, Prawns, Squid Ink by tgb9593. Bookmark the permalink.